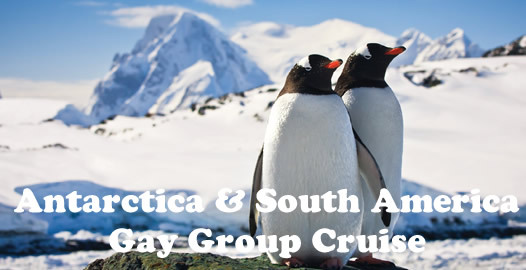 Experience the unmatched beauty of Antarctica and South America on a Pied Piper gay group cruise around South America. 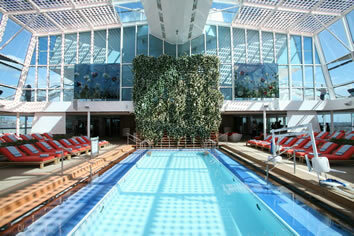 On this 14-night cruise you'll set sail round-trip from the contemporary urban capital of Argentina, Buenos Aires. On your journey around Cape Horn through the Strait of Magellan, you'll head to the unparalled beauty and magnificence of Antarctica. 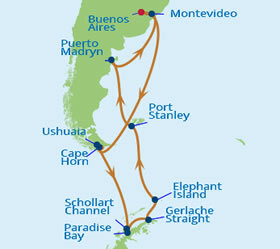 After that, it's visits to the Falkland Islands and interesting ports in Argentina and Uruguay. It's the perfect time to get away for the South American summer. Imagine the fragrance of a lush lawn of real grass on the top deck, being able to watch glassblowers creating art before your eyes, or having the choice of dining in one of ten stylish restaurants. Another first on this groundbreaking class of ship is a new category of premium balcony stateroom called AquaClass, a tranquil haven conveniently located close to the spa facilities. 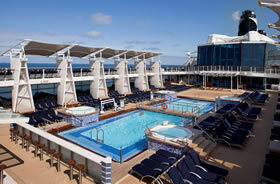 Step onboard Celebrity Eclipse and be treated like the star you are. Your Celebrity Cruise will leave you feeling recognised, celebrated and indulged and with plenty of time onboard to enjoy the many luxuries available. A wide range of spacious en-suite staterooms and suites to meet your needs. As you'd expect, all are appointed to an exceptionally high standard and include a stateroom attendant at your service, plus a host of other extras. Award-winning cuisine served in a large choice of venues to suit your mood or appetite, for example our renowned Speciality Dining Restaurants, the AquaSpa Café, and even a Sushi Bar. The main dining room radiates a classic elegance - table luminous with gleaming china and crystal set against a backdrop of crisp linens and gorgeous ocean views - open for breakfast, lunch and dinner, as is the more informal Casual Dining Boulevard with its themed buffets.You'll have complimentary room service 24 hours a day, while iced water, tea, coffee and lemonade are available whenever you like. Celebrity Eclipse also features no less that four of our renowned speciality restaurants - Silk Harvest (Asia fusion), Tuscan Grille (Italian-inspired steak house), Murano (contemporary European) and Blu, serving healthy but delicious cuisine exclusively to our Aquaspa guests. West-End style shows, stylish bars and cafés, comedians, classical and contemporary musicians and entertainers, dancing, nightclubs, movies, access to the casino, and more are just a selection of the activities available to entertain you onboard Celebrity Eclipse. A myriad of venues await - be seduced by the lights and movement on the spacious dance floor of Quasar, a refreshingly vibrant nightclub where retro styling fuses with contemporary rhythms. Ascend to the Sky Observation Lounge, where the bright canopy of the heavens appears to lie just within your grasp.We believe a glass of great wine can be a truly enjoyable experience, and the friendly ambience of Cellar Masters is the perfect place to savour and old vintage or discover something completely new. Rest assured that your time at sea will be as richly rewarding as the destinations themselves, and that you'll have countless opportunities to fill your days and broaden your horizons. Celebrity Eclipse offers an elegant marble-paved galleria of boutiques, with no less than 18 shops spanning three decks - including high-end Boutique C and The Lawn Club Shop. And don't miss the art onboard as throughout Celebrity Eclipse you'll see museum-quality artwork on display by masters like Picasso or contemporary painters like Peter Max or David Hockney. Even better, Celebrity's on-board art auctions give you the chance to buy original works from many well-known artists. Prepare for pleasure in the Paris of South America. In the oldest barrio - San Telmo, try the tango and the (equally spicy) chorizo sausage. Visit an estancia (ranch) to see cowboy horsemanship at its best, then pay homage to Evita at Casa Rosita. Cosmopolitan Buenos Aires, whose name means city of "favorable winds," is the capital of Argentina. With broad, well planned avenues, charming sidewalk cafes, carefully tended parks, elaborate monuments, noble statues and splendid rococo buildings, it exudes an air of sophisticated elegance. • The city is a delight for exploration on foot and by car. Visit the colorful quarter of La Boca or San Telmo district with its artist colony and well-known tango clubs. • Plaza San Martin - This shady square at the beginning of the Florida pedestrian street is a focal point from where to start a shopping spree. The Marriott Plaza Hotel fronts the square. • Plaza de Mayo - This is the major hub of Buenos Aires surrounded by the city's most important historic buildings, such as the Cabildo (Town Hall), the Casa Rosada (the presidential palace) and the Metropolitan Cathedral. • Church of San Ignacio de Loyola - Recognized by its two lofty towers, this church was built in 1710 and is the oldest colonial building in Buenos Aires. • Santo Domingo Church - Founded in 1756, the church served as refuge to British soldiers during an attack of the British on Buenos Aires in 1806. When the British capitulated, their regimental colors were preserved in the church. • National Museum of Fine Arts - The museum features a fine collection of European works as well as those of many Argentinean artists. The cultural heart and political capital of Argentina, Buenos Aires is a sprawling city of broad avenues, parks and flowers. Sample the fare at a sidewalk cafe or shop for leather goods on Avenida Lavalle, tour the ornate Teatro Colon opera house or visit a local tango parlor. For sheer physical beauty, the Land of Fire is hard to beat. To view the wonders of the region’s amazing fauna and flora, board the aptly named ‘End of the World Train’ on a scenic 12km adventure to the pristine Parque Nacional Tierra del Fuego. The southernmost town in the world, Ushuaia sits at the edge of Tierra del Fuego, Argentina´s "land of fire," so named because of the fires lit by Indians to warn of the arrival of Magellan´s ship. Surrounded by a countryside of snowcapped mountains, dense forest, rivers and waterfalls, the town has a rugged, frontier spirit. Nearby Tierran del Fuego National Park is a wildlife sanctuary. Savor the spectacular beauty of Tierra del Fuego's lakes, lush forests, flora and fauna and soaring mountains by train, 4-wheel drive, on horseback, or on an off-road forest trek. Enjoy the expansive views from Garibaldi Pass and watch for sea lions and albatross along the Beagle Channel. Cape Horn (Span. Cabo de Hornos), promontory, South Chile, is in the Tierra del Fuego archipelago, on Horn Island. Tierra del Fuego, Land of Fire, is the most isolated place in the Americas, and Cape Horn is its southernmost point. These craggy cliffs and windswept shores are stark, rugged beauty personified. It marks the southernmost point of South America and extends into Drake Passage, the antarctic strait connecting the South Atlantic and South Pacific oceans. The rocky terrain of the cape rises to a height of 424 m (1391 ft). Storms, strong currents, and icebergs make passage around the cape extremely hazardous. You are certain to leave with amazing memories, and pictures, as you cruise through Schollart Channel. Take in the mesmerizing sights of massive ice flows, humpback whales, waddling penguins, leopard seals in their natural, and somewhat extreme element. 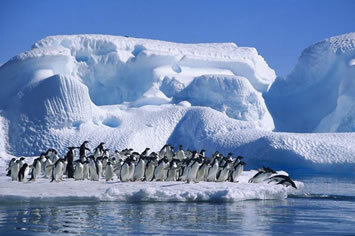 The Schollart Channel of Antartica has breathtaking ice cliffs, glaciers and icebergs. A stunning view as you cruise through this area. The name is not an exaggeration. Here 100-foot high glaciers and precipitous mountains present an imcomparable panorama, a riot of color in white, red, yellow and blue. A number of geographical anomalies around this channel make these waters among the most plankton-rich in the world. You’re likely to see a profusion of whales feeding in the rich ecosystem, which is a sight you’ll not soon forget. A famous body of water in the Antarctic Peninsula, The Gerlache Strait is a must see for many people visiting this part of the Antarctic on board an Antarctic Cruise due to its spiky blue icebergs, humpback whale spotting, snow and mountains. 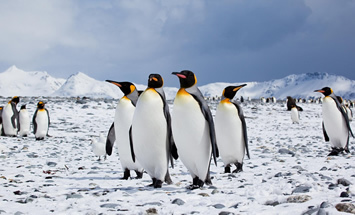 It can be found between Anvers Island and the Danco Coast and is usually visited en route to Neko Bay or the Lemaire Channel where ships cross the Antarctic Circle at 66 degress. The Gerlache Strait is named after the Belgian Adrien de Gerlache, who explored the strait in 1898. This tiny island in the Weddell Sea plays a role in one of seafaring history's most legendary exploits. When the brave crew of the Endurance, led by explorer Sir Ernest Shackleton, was trapped in the ice during a 1914 polar expedition. Elephant Island in the South Shetland Islands, off the coast of the Antarctic Peninsula, is named for its abundance of elephant seals and is home to. It became the unlikely home of Shackleton's crew for 105 days in 1916 after their ship Endurance was crushed in pack ice in the Weddell Sea. Living on penguins and limpets (no seals inhabited the area at that time) and taking shelter in an improvised hut made from two wooden boat hulls, they were rescued by Shackleton. He and five men had traveled more than 800 miles in an open boat to South Georgia Island to seek help. Today, elephant and Weddell seals, chinstrap, gentoo, and macaroni penguins can be found on the spit of land Shackleton's men name Point Wild. If you’re a birder or photographer – or aspiring to be either – the Falklands delivers in spades. See if you can spot a flightless Steamer Duck. Your cruise wouldn’t be complete without a stop at the museum chronicling the 1982 Argentinian invasion. Dramatic cliffs, windswept rolling hills and sandy beaches make a scenic home for the Falkland´s countless waterfowl and 2,000 hearty British descendents. Shop for woolens and crafts on Port Stanley´s main street or sample the diddle-dee jelly with afternoon tea. Good walkers can explore Stanley easily on foot. Major sites, such as t he cathedral, the museum at Britannia House and the Battle Memorial are included in the organized excursions; they also can be visited on your own. A stroll along a section of the waterfront will show you the hulks of old sailing ships. Key points are marked with interpretive signs. Step into the pages of National Geographic in this unique ecosystem. Three-ton elephant seal bulls bask with their harems along the shoreline, sea lion and penguin colonies abound, and the Southern Right Whale’s breeding grounds are just offshore. Puerto Madryn is the gateway to the large wildlife preserve on the Valdes Peninsula, with its collection of birds, sea elephants and offshore whale breeding grounds. Puerto Madryn boasts several fine seafood restaurants and is growing in popularity with Argentine vacationers. Explore this wildlife paradise and its surrounding quaint towns. Visit an exuberant sea lion colony, watch for nesting cormorants, magnificent elephant seals and observe sheep-shearing on an estancia. 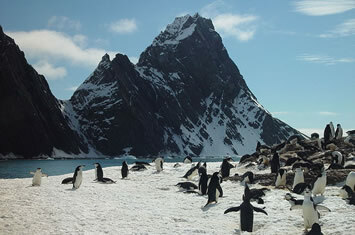 Or experience a walk through a colony of Magellanic penguins and myriad species of native seabirds. Visit Ciudad Vieja district and see how the Spanish, Portuguese, Italian, French and British all left their imprint on the old city. At Harbour Market, try meat roasted over an open-air grill, washed down with Medio y Medio (half wine, half cider). Heavily influenced by European culture and architecture, Uruguay´s capital is a vibrant, modern city famed for its fresh water, white sand beaches. The Museo do Goucho chronicles the region´s famed cowboys and the colorful Mercado del Puerto boasts a variety of eateries. Highlights include Ciudad Vieja (Old Town) with its 18th century buildings, the vibrant Mercado del Puerto, and the bustling commercial activity of Avenida 18 de Julio and its cultural offerings (theatres, museums and art galleries). 03 Feb A Day at Sea! 04 Feb A Day at Sea! 05 Feb A Day at Sea! 10 Feb A Day at Sea! 12 Feb A Day at Sea! 14 Feb A Day at Sea! 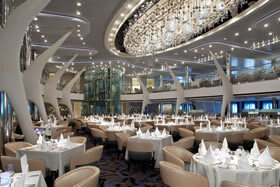 The magnificent and luxurious main dining room of Celebrity Eclipse. With a two-story glass wine tower and dazzling chandeliers, this quintessential dining area has a decidedly Hollywood aura. 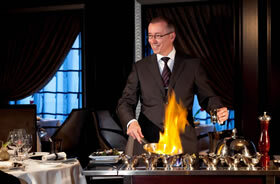 Serving savory World & Continental cuisine, complete with Celebrity's famed European-style service. 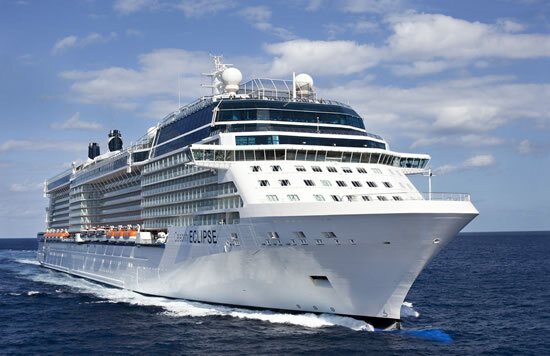 The grand Eclipse Theater is the premier live performance venue aboard Celebrity Eclipse®. While accommodating a generous audience, it retains a comfortable, intimate atmosphere, bringing you production shows, beautiful musical arrangements, and sidesplitting comedy. Immerse yourself in the culture of wine within the inviting atmosphere of Cellar Masters, our wine bar. Cellar Masters offers you the opportunity to try a bold collection of both familiar and unknown wines from around the world. To help you explore these wines, we feature the state-of-the-art Enomatic® wine-by-the-glass dispensing system. With a simple swipe of your SeaPass card, it will pour your choice directly from the bottle in a 1-ounce, 2.5-ounce or 5-ounce portion. Our Sommeliers will guide you in the use of the Enomatic system and offer further insight into the fine art of wine selection, an integral part of an epicurean lifestyle. Then, you'll be ready to begin your travels through the world of wine. Qsine® offers a culinary journey that delivers elements of surprise and delight. Our James Beard featured Master Chef created Qsine to give you something you've never experienced before—on land or at sea. Leave any preconceived notions behind. Dig in and try new things. It's time your palate got a wakeup call. Our iPad® menus make your dining experience even more fun and interactive. Feeling lucky? Combining the ambience of Monte Carlo and the energy of Las Vegas, Fortunes Casino is a perfect spot to participate in a game of chance or comfortably view all of the action at our ticket in/ticket out slot machines and table games. On the totally cool, ice-topped bar, our talented bartenders put on a high-energy show preparing an intriguing menu of classic and contemporary martinis, including the 20-Year Martini in celebration of Celebrity's 20th Anniversary. Sit back in the contemporary plush high-back chairs while listening to up-tempo tunes and enjoy a collection of classic and rare vodkas and a portfolio of fine caviars. For lively, diverse entertainment, the versatile Celebrity Central is the perfect destination. Catch a late night comedy show, an engaging presentation from one of our Smithsonian Journeys speakers, or a great movie in a comfortable, casual atmosphere. Beautiful walkways lead you to sophisticated boutiques that hold stylish clothing, jewelry, cosmetics, fragrances and more. Window shop, attend a fashion show or select gifts for friends and family. 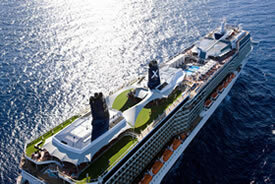 Then, indulge yourself as you encounter the ideal memento of your truly extraordinary cruise experience. A premium, private lounge for those in Reflection, Penthouse, Signature, Royal, and Celebrity Suites, as well as for Captain’s Club Zenith members. This luxurious club features a large-screen TV, reading areas stocked with magazines, newspapers, and books, plus a continental breakfast. Complimentary drinks are available throughout the day and canapés are served with evening cocktails. Michael’s Club is available 24 hours a day with selected service hours from the Michael’s Club Concierge. 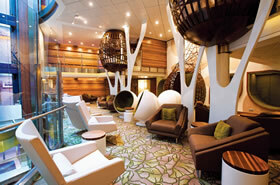 Travel meets conservation at the Team Earth venue on Celebrity Eclipse, where guests can raise their own eco-awareness while also learning how Celebrity's ships operate, and how their advanced systems help conserve the environment. A quiet refuge by day for gazing over the sea with a cocktail at hand. At night, the space comes to life with live music and dancing. In addition, special interactive theme parties include Live@Sky-music and dances of the 40s with a modern twist-and Motown, featuring funky soul with a live band, singers and dancers. Don't just appreciate art, experience it. Witness the incredible, gorgeous art of glassblowing with intimate live demonstrations. Watch and learn from professional glassblowers in this one-of-a-kind exhibition on Celebrity Eclipse. 2b - Deluxe ocean-view double stateroom with veranda Stateroom: 194 sq. ft. Veranda: 54 sq. ft. Floor-to-ceiling sliding glass doors, Two beds convertible to queen-size, Sitting area with sofa, Vanity, 32" LCD TV, Wireless internet access, Veranda, Some staterooms may have a trundle bed. 2a - Deluxe ocean-view double stateroom with veranda Stateroom: 194 sq. ft. Veranda: 54 sq. ft. Floor-to-ceiling sliding glass doors, Two beds convertible to queen-size, Sitting area with sofa, Vanity, 32" LCD TV, Wireless internet access, Veranda, Some staterooms may have a trundle bed. 1c - Deluxe ocean-view double stateroom with veranda Stateroom: 194 sq. ft. Veranda: 54 sq. ft. Floor-to-ceiling sliding glass doors, Two beds convertible to queen-size, Sitting area with sofa, Vanity, 32" LCD TV, Wireless internet access, Veranda, Some staterooms may have a trundle bed. 1b - Deluxe ocean-view double stateroom with veranda Stateroom: 194 sq. ft. Veranda: 54 sq. ft. Floor-to-ceiling sliding glass doors, Two beds convertible to queen-size, Sitting area with sofa, Vanity, 32" LCD TV, Wireless internet access, Veranda, Some staterooms may have a trundle bed. 1a - Deluxe ocean-view double stateroom with veranda Stateroom: 194 sq. ft. Veranda: 54 sq. ft. Floor-to-ceiling sliding glass doors, Two beds convertible to queen-size, Sitting area with sofa, Vanity, 32" LCD TV, Wireless internet access, Veranda, Some staterooms may have a trundle bed. Taxes of $327.21pp, optional travel insurance, and gratuities are additional. Web Page © Happy Travel, Ltd. Logos and Images © RSVP Productions Inc., Atlantis Events Inc., Pied Piper Travel, etc.